In the Simulator choose Tools and Animation Toolbox and 3D Animation to open a 3D Animation window. • To start editing, from the Properties menu select 3D Properties . 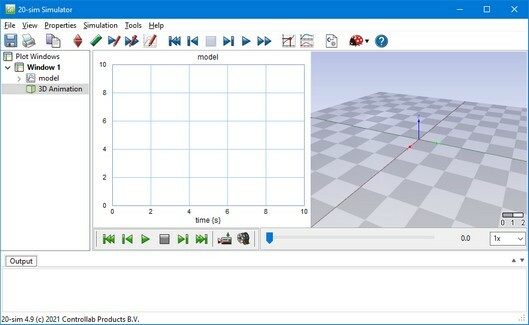 This will open 3D Properties window where you build your animation. • You can run an animation by clicking the green run button . You can also select the Run command from the Replay menu. • At the top right of the window you see the Speed box where you can set the replay speed. The default speed is to replay an animation at real time but you can set it to play an animation faster or slower. • If you have multiple camera's in your animation, you can switch camera, by clicking the camera button . • Ray Tracing will add shadows and mirror images to a 3D Animation. From the File menu, select RayTrace to apply Ray Tracing to the current window. • From the File menu select Create Movie to create movies from your animation. • Right click your mouse when pointing on a 3D Animation. Select Full Screen to see the animation in full screen. Click the Escape button to remove the full screen view.